If I may add one more action to the above list: Hide out. 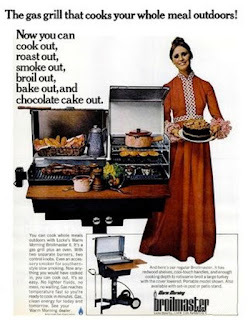 Atrocious even by 1978 standards, that dress stuns with its street-sweeper length, barbecue-sauce color, and rick-racky trim. 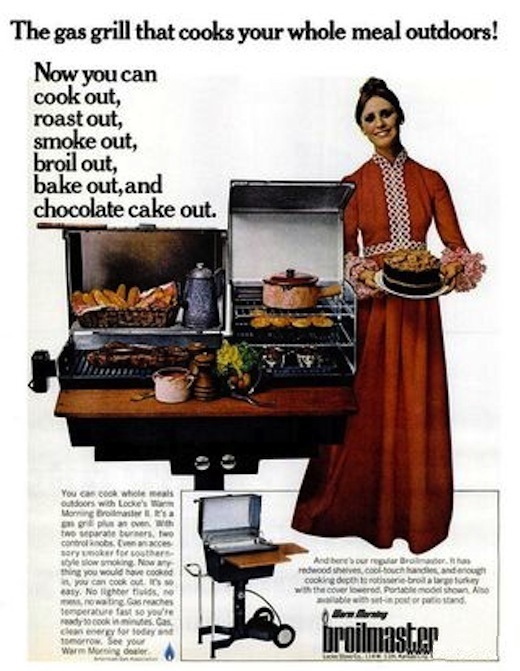 On a practical note, those ruffled cuffs could do double duty as grill-grate scrubbers. But let's not get too distracted by fashion. The Broilmaster offered an impressive array of features, if not very much cooking area. Certainly subsequent models would locate the prep shelf to the sides of the unit, and the pedestal base could stand a beefing up.